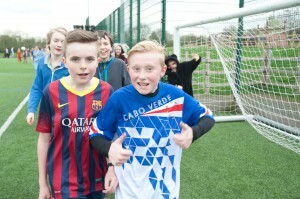 On April 4th, we held our 3rd annual fun run and a non uniform day. This year, 800 of our pupils volunteered to take part, our largest number so far. Fancy dress was optional and there were some very interesting outfits on display; many from the staff of the college looking to outdo each other! The College was fundraising for 2 very special causes; The Nicholls Spinal Injury Foundation and Kash4Kenya. The Nicholls Spinal Injury Foundation is the chosen charity of Claire Lomas who recently visited the college to speak how she has rebuilt her life since being paralysed from the chest down in 2007. Kash4Kenya is a Brockington College project which helps provide opportunities for those youngsters in our partner school in Mtwapa, Kenya. The grand total raised from the fun run stands at a massive £6037.27. A massive thank you to all those who took part in the event and collected sponsors. Your hard work and generosity is amazing. A big thanks also to all the staff who helped to supervise the event. Claire Lomas has given a signed copy of her book “Finding my Feet” to the top fundraisers. The winners were Lizzie Chauhan, Freya Williams, Georgia Ogden and Maigan Kirk. Click here for a selection of photos.